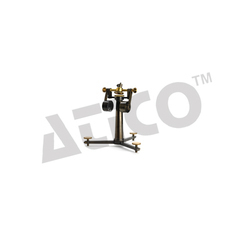 Our product range includes a wide range of sextant stand. Advanced Technocracy Inc. are manufacturer, supplier and Exporter of Reverse Trendlenberg Position Tables. The sextant stand consists of a dark-brown lacquered brass column on tripod stand with three adjustable feet for levelling by screws. There is also a counter-balanced swinging mount for a sextant, which can be locked into any desired position. The adjusting pin is missing. The stand is contained in a polished wooden box. Looking for Optical Bench ?